Lord Saint Germain is the Mahachohan of the Seven Rays of God. In this integrated channeled message he shares more on what it means to become 5th Dimensional. Ascended Masters Djwhal Khul and Serapis Bey also share their thoughts on the relationship to our Solar Angel. I Am Lord Saint Germain, the MahaChohan of the Seven Rays of God. I come to you today to talk about how to bring forth the ability to continue the walk through your Initiations even when you feel as if you want to stop because of lower emotions or experiences that occur that can bring you into a state of wanting to give up. You have to continually remind yourself that you are a Being of Light and without that light you could not hold yourself within your physical body. Did you ever consider that thought in your consciousness? Let’s think about it – you come from a light essence that was conceived through the frequency of Divine Mother and Father God, who by the way was conceived by the Creative Source of Oneness. This means you are from this Divine Oneness and were born to come into various forms of existence. When you arrived into that state of higher consciousness, you had no misconceived thought that it would not be anything but totally bliss – to share your light to others and to bring into creation Planets in the Multi-Universes. As you have traveled far and wide through this journey, you have forgotten your Divine Essence of being angelic, being free flowing, being one in all of the creative process. Instead you have experienced the density of planetary life and now you have awakened once again to remember all that you are. This journey is quite challenging in itself as you have to learn how to deal with the essential components of your soul body of light which can be riddled with darkness. You go through the initiation process because that is what you do as one who has awakened to the light within. You step into this journey wanting to be more than you have been before on the earthplane, but yet it is a challenging step to walk into the abyss of the old to find the New Beginning that is awaiting for your arrival. This is a continual process walking through the many levels of ascension mastery. As you realize the potential that you can be, then you realize the ability to be all that you truly deserve. The dreams you have had in the past can be your reality as you move through the doorways that previously were blocked from your awareness. Each of us as masters have taken on this role and you now, in this timeframe, are becoming that same Initiate of Mastery. It does not matter where you are in your initiation process as the struggle can occur at any time especially through the Planetary Ascension Process which is up through the 7th Initiation. Some students may think it is like a magic wand and everything becomes perfect when you reach that level. Unfortunately, it is not true. You still have to work through your elements of achieving ascension mastery but then in the higher realms of light. Sometimes it can be more challenging physically as your physical body will change drastically. The important element is how do you achieve the ability to feel better about what you are experiencing especially when the Lower (physical) Mind wants to come into play of your emotional state? Surrendering is the first step to take in all that you desire to achieve. As an initiate of mastery, you must realize the potential you have when you can let go of all misconceived notions that have been set in your subconscious mind of What You Should Be Doing instead of realizing the potential of fully accessing your Spiritual Self. This is not always an easy task as you probably already know. Diligence is the key along with the ability to be patient with yourself. How do you get from being a purely 3rd dimensional physical person into learning how to breathe, act, think, and feel through a 5th dimensional self? The first element is to realize the steps you have had to take through many eons of time to get to this point: of truly desiring to be an Ascended Master. It is not something that should be taken lightly; it is very serious and it takes deep consideration for fore-thought of how to move from the old self into a more attuned healthy four-body system along with acting upon that essence that you are becoming. The truth of the matter is every initiate must have the Hope and Faith that new doorways will always be opening and the steps to walk through those stages of growth need to be fully realized by a higher part of your reality which is your Solar Angel. In order to fully accept that your Higher Self is your guiding light, you must realize that there is a bridge of communication between the Physical Mind and The Higher Mind. Your Solar Angel is with you to help you remember your angelic remembrances so that you can step through the doorways of light and dark to help you accelerate through your challenges. That is what true Mastery represents. It is the part of you that did not realize you were an angel as you are on the earth, but yet when you access those attributes of your Divine Self, you can start to fully accept the potential that is within you to be angel and human. It is the light that you have been asking to be within you as it guides you into the higher realms of light through the Higher Self. That is just the beginning as you learn to access your Monad (the other souls that work with you), and then your I Am Presence. So many students try to reach the top first and get lost because the steps in between have not been acknowledged. You must have a solid foundation in order to hold the higher energies. That is why there is Mastery so that souls can go through the initiations or steps to fully remove the old elements that no longer serve a soul’s purpose. Along the way each step you go through gives you a moment of accomplishment but not for long. As the road of Mastery is paved with great challenges but wonderful moments of realization as that soul. This is why it is important to not ignore the Solar Angel as this part of your essence will help you to have the Faith, Patience, and Ability to walk through any storm no matter how small or large it is. This is when you as the Soul becomes One with the Angel to initiate Hope into your awareness no matter what the circumstance. The journey of the Soul into the Angel into the I Am Presence is riddled with great moments of excitement and joy as you will realize the potential you have to no longer fall back into what you were before. It is exhilarating to see initiates make the changes and create a new foundation of light within themselves. I as Lord Saint Germain totally understand what you are going through and that is why I am here to help you through each step of your journey. The ecstasy of Mastery will come to you eventually but the initial steps will take you back into your soul’s history to help you heal the parts of yourself that have been forgotten so that you can fully hold the higher essence you are becoming. I have asked two of my Ray Chohans to say a few words on this step of the journey of Initiating Hope and Faith with Master Djwhal Khul, Ray Chohan of Love and Wisdom, and Master Serapis Bey, Ray Chohan of Harmony and Balance through Conflict. I am Master Djwhal Khul and I am delighted to share some thoughts with you on the subject of how Love and Wisdom will assist you understanding how be One with Hope in your life. I see life without hope is a life riddled with pain. As humans, each individual truly needs to acquire the ability to learn how to receive hope in any given situation. Without hope, it is like a stream without the river flowing with in it. It is a dry well in which an individual cannot see the beauty in anything as all they see is the pain of it all. I see the process of initiating Love within your life cannot be done without the Angelic Presence that as humans is very important for their spiritual development. What does an angel represent to you? To me it says softness, beauty, joy, flowing energy, and an amazing singing voice that you can hear through the wind. If you can imagine yourself as that angel, you shall always acquire Hope along with Faith to be your guide. Within the Ray of Love and Wisdom, I help to bring forth the flame of Golden Yellow through the Elders Lord Ralya & Lady Ralyio. It comes into your Crown Chakra which is the spiritual center and then elicits a beautiful essence to flow through all parts of your existence, all chakras, all healing centers, your cellular level and into all of four body system. It is like the warmth of the sun beaming down upon you; it burns up the dis-ease that is in your mind and causing your emotions to be imbalanced. It is a soothing light to the darkness that you have been feeling. When you allow yourself to fully breathe in this essence, it cannot help but assist you to accept the challenge as a lesson as it becomes One within you. The Golden Yellow Flame is the pure existence of God’s light of the Christ Consciousness in small increments. It allows your lower mind to release the pain as your Higher Mind ignites its power through you. It is important to realize that all the pain you have within you can be healed. All of it is possible and that is way you have awakened. Getting mad at the process will not assist the energies as it will just ignite more fear to occur within you. Allow my essence to help you calm your subconscious mind in order to receive the Divine Light you are. That is pure surrender unto your Solar Angel and Higher Self. It is the start of a grand beginning and you will thank yourself for doing so. I walk with you, call upon my essence to help you through your challenges so that you can be the Master you desire. I come to you as Master Serapis Bey and I am deeply honored to speak with you in this moment. The main element I want to convey is that I bring to you the Love of God. It is my role upon this earth as being the master I have been for eons of time. When you cannot accept what is happening to you, I will come to assist you. In fact, if you have said to yourself that you desire to learn more about your ascension pathway as an Initiate, you and I have already met. It is my role to assist every student to help them heal and clear up their aura so that the pathway of their initiations will be clear of any other elements from the outside world they may have encountered. So many times when an individual awakens to the light within them, and starts to see this light around them, they have a tendency to truly need a clearing and cleansing of their auric field. It is my duty within the Crystalline flame to assist students to be able to get to the core of their essence. So many times initiates cannot see these things within themselves because they have been conditioned to feel them consistently like they are a part of them. My role is to help each of you move more easily through your initiations and not allow the lower mind of lack of understanding to overcome their emotions. The Crystalline Flame with some specks of green light will assist each of you to clear away elements of debris that has been lodged within your field for a long time. Just because you have awakened unto the other worlds does not mean you are ready to deal with the responsibility of having these gifts as it can create inconsistencies of your life or memories of your past lives. I give you the Love of God to embrace you deeply and help you resurrect the old elements so that a new beginning can take place within your consciousness and then in your Heart. This is so the Solar Angel can help you to achieve what you desire to be – a Divine Being of Light. I give you serenity, and to be mentally balanced with self confidence in all that you see and do in your Life. It is my pleasure to walk with you in Oneness as we learn from each other. Interested in fully understanding how the energies of HOPE AND FAITH apply to the Initiations within Ascension and getting energetic healing transmissions to assist you to do so? We invite you to Enroll in a very powerful seminar class given by Lord Metatron and Lord Saint Germain with Masters Djwhal Khul and Serapis Bey which occurred on Saturday, March 18th, 2017. This is a two-hour class which you can utilize on your own time via the MP3 recording. Did you find this post educational for your higher understanding? Not able to enroll? Instead please consider supporting our work with a $3 donation for this article. Everyone reading this can help make a difference. We require public support to bring forth these important Ascension Mastery transmissions. 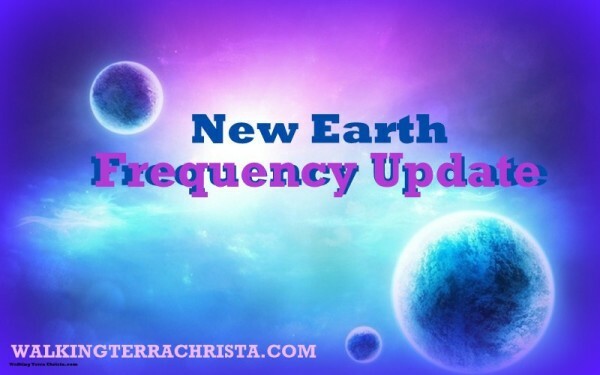 © Copyright 2017 The Walking Terra Christa Academy of New Earth Mastery.WalkingTerraChrista.com by Rev. Christine Meleriessee Hayden and Rev. J. Michael Hayden (Ara). Personal use and providing a link to this article for informational or educational purpose (articles, websites or blogs) is welcomed and encouraged except any use related to or associated with profit making activities (including individual, business or organizational websites, publications, blogs, etc.) Reprinting or reposting this material for publications, websites or blogs that sell or advertise any products or services (as well as any printed or written reproduction) is not authorized without written permission. Rights are only granted to repost this material (in full and unedited with working url links) electronically on informational websites or blogs that do not sell or advertise any products or services. In such cases, you must include this complete copyright statement in full including the above active url referral links to help everyone stay informed and support our messages. In cases of text only formats, these active url links may be converted to display the full path of the url as linked. The information contained herein does not constitute the rendering of healthcare advice or the provision of treatment or treatment recommendations. It is not to be considered or inferred as medical or psychological advice. Use of the WalkingTerraChrista.com website and its originating content constitutes agreement of terms as provided under Website Terms and Disclaimer (click here).